I've wanted to trike the ULCER for a couple years. In a way, being able to ride this 100+ mile century ride around Utah Lake was a motivation for me to lose some weight and get in shape. I picked the ULCER as my first trike century mainly because it is close to home. Much of the route is my regular commute route and the country roads are just blocks from my home. It was a tough ride, but very satisfying. I�m happy with my performance and know which areas to train in for the next one. As mentioned in a previous article, I had been training for this event for several weeks. For the most part, I think my training paid off. I chose to ride a trike, at what is mainly a bicycling event. I was the only trike that rode the entire century route, and feel that I represented us well. For details on my trike click here. The reaction to the trike was generally positive. In the parking lot and in the starting line the comments were things like: "Man, that is a sweet ride." On the route comments tended to be about how fast I was and they were amazed how fast I could climb hills. I only received one negative comment during the initial mob start from a guy who thought I would hit someone due to my low height. Immediately, the faster riders pulled to the front and I stayed right with them. I got to experience being part of a 2-3 line pace line and even got to lead for a few miles, although I don't think they got any draft off of me. With this configuration we averaged about 26mph to Springville (22 miles) to the first rest stop. At the rest stop most of the crowd stopped, but I decided to keep going. I had brought a 3-liter Camelbak and snacks so I wouldn't have to stop as much. From that point on I was on my own and no longer rode as part of a group. It was a great start though. 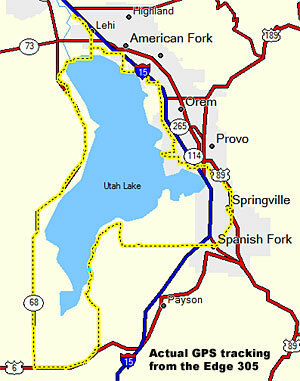 The route from Springville through Spanish Fork is one I ride frequently. Although there is a good hill climbing out of Springville, I was able to maintain a speed of 20mph up to the crest. Once I started the downhill descent I got over 30mph and stayed over 24mph until the overpass leading into the country roads of Lakeshore and Benjamin. This is my home turf so I felt very comfortable knowing which parts of the road to avoid. Coming down the overpass I was in my highest gear and was riding about 28mph. As I crossed the railroad tracks I failed to notice the crowd of team riders ahead scattered along the road fixing tires. As I went flying over the tracks--BOOM front left tire went instantly flat. I was prepared for a punctured tube, but was sure my tire had been compromised. I tipped the trike on its side and could find no damage to the tire. I had brought one spare tube, so I quickly changed it out and was ready to roll. It was almost comical though because just during the short time I was changing my tube about 6 other bikes got flats on the same tracks. As I started riding again the next 2 miles were littered with riders changing tires. Some leaks are slower than others. The next 8 miles of the route were country roads through Lakeshore up to the Lincoln Park Marina. These are country roads with a fair amount of potholes. I ride right in the middle of the road out here, as there is no shoulder, and thorny weeds grow right on the edges. I saw about 6-7 cyclist in this area fixing flats. Although most of this stretch is fairly flat. There is a decent hill right in the middle that gets you on the ledge of the mountain and then a slight descent towards the marina. Not enough of a descent to coast though, but considering the road condition I was still able to keep it over 20mph. Starting at mile 48 I hit the backside of West Mountain. Up until this point my average speed was 24mph and I felt like I had a good chance of doing a 5-hour century. The next 16 miles is comprised of rolling hills and was further complicated with a pretty strong headwind. I was able to make some decent speed on the descents, but it was all the uphill climbs that about did me in. I really appreciated the XT fairing going up the hills because it took the edge off the headwind with minimal weight. I knew I wasn't even halfway through the ride though, so I decided the best way to deal with the hills was just to pace myself, gear down, and keep a constant cadence. I kept my cadence at about 75rpm and just shifted when needed. It was this section that I seemed to get passed by several cyclists. My average speed for the backside of the mountain section was about 15mph. Coming down into Genola from the backside of the mountain is a nice descent, and I felt like I was going to be able to pick up speed again. I hadn't planned on stopping until lunch, but I noticed my front right tire was looking kind of soft. So, I pulled over at the mile-62 rest stop and checked it out. Sure enough, I had a thorn stuck right at the edge of the tread and the sidewall. As soon as I removed the thorn the air leaked out. This time I had to use a patch on the tube, so it took a couple minutes longer to repair. I should mention here that I really like the Kojak tires during the repairs. They are extremely supple so I didn't even have to use a tool to get the tires back on. Since I was already stopped, I took the opportunity to fill my Camelbak with ice, but it turned out they were out of water. Back on the road after my flat and only five more miles until the lunch stop. This was hopefully, the last stretch of road with a headwind. It was mostly a downhill ride into Goshen, but the headwind just balanced out gravity. My legs were feeling tired and I could feel a lack of energy, so I decided to stop, grab a sandwich and restock my Camelbak with liquid. I had tried eating while riding but it didn't work out very well. The lunch stop was well stocked with sandwich fixings, fruit, granola bars, and other snacks. I stuffed myself pretty good, snarfing food at a good rate. I kept my time there to a little over 5 minutes. After the lunch stop there was about a one-mile climb and then a long downhill stretch. It was here that I hit my top speed of 38.1mph. I was able to stay over 30mph for much of the route and thereby made up for the time I lost climbing. It was comforting to know that I was now headed back, but despite the downhill run I was starting to feel exhausted. The sun was hot and I was sucking Gatorade down pretty hard. I had mixed it a little too strong in Goshen and knew I would have to dilute it at the next stop. The next stop was at the 87-mile mark and at the bottom of a hill. I thought of skipping it so I wouldn't have to start back up on a hill. Ultimately, my desire for water won over and I made a quick pit stop. I refilled my Camelbak with straight H20, grabbed some melon and was on my way again. With about 20 miles to go I got my second wind. The food energy started to kick in and I felt much as I did earlier on. As I passed Saratoga Springs and started to curve around the North part of the lake, I noticed my distance was right at 100 miles, with a time of 5:15. I felt pretty good at that point and thought they should have put a sign up so we'd all know we had hit the official "century" mark. With only about 10 miles to go, I was headed for the final stretch. At the north side of the lake the route diverted from HWY 68 and went through some residential neighborhoods. I was pretty much on my own and the route wasn't very clearly marked. A team of riders passed me so I hung in behind them. As we were taking turns through a neighborhood I lost them and ended up taking a wrong turn at some point. I wandered around the neighborhood heading in what I thought was the general direction, and finally stopped to pull out my sheet of directions. I was so close, and yet so far. Eventually a passing motorist saw me and realized I was lost. She graciously pointed me in the right direction. This little snafu probably cost me 3-5 minutes. As I started to come out of the residential area, I eventually saw HWY 15 and knew I was close. As I turned left I could see the Thanksgiving Point sign and knew I was close. I picked up speed and headed toward the sign. They had marked one of the side roads with an arrow so I took a turn. I laid on the speed when I saw the sign that said "Finish Line 400 Yards Ahead". As I rode past the finish line, there were spectators clapping giving the riders a final cheer of support. They only timed the teams, so they just passed me through and into the pavilion area. Somehow, it seemed just a little anticlimactic. As I rolled out of my trike and lay on the grass I felt very satisfied with myself. I hadn't gone quite as fast as I'd hoped, but I did kept a fairly consistent pace. I finished the ride and there were still a lot of people behind me. It was fun being the only trike on the route and I think I gave some of the cyclists an idea of what these trikes are capable of. I know what I need to work on for next year and will be spending some training time going around the mountain climbing those hills. Well, I am definitely hooked on the Century rides. After talking to several cyclists, who ride various centuries every year, I am very excited to ride more. 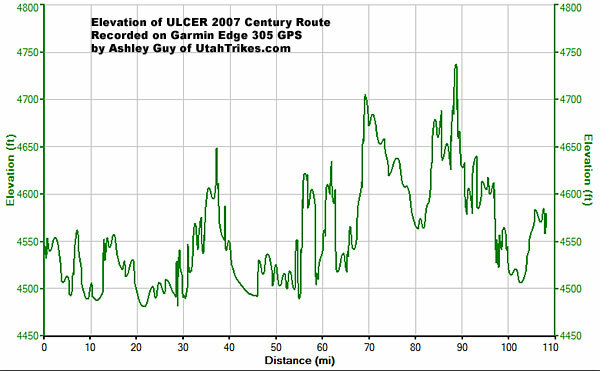 I'll immediately start my training for the "Big Nasty" Moab Century in October. It is a lot of climbing so I'll have to change my gears for that. The biggest thing I think I can do to make improvements is to shed more weight. The hills are what slowed me down the most and I think that was mostly due to the weight. I'll probably start by stripping the trike down as much as possible, but most of the weight will have to be mine. I'll also keep my water to a minimum and refill more often at the different stops. I'd like to get more trikes involved as a team so we could set up our own pacelines.